Free costume patterns can make your project less expensive. Find out where to find free, and almost free, patterns. Whether you need a pattern for a historical costume or a Halloween costume, you can always find them in local fabric stores. 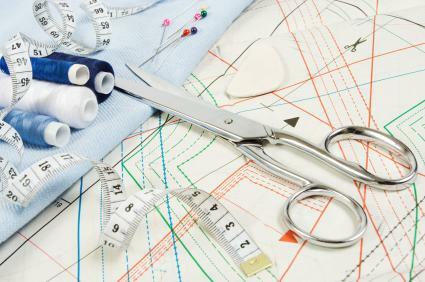 However, there are a few other places to find free or inexpensive patterns. Historical societies: A little-known place to find historical patterns that you can copy (they usually aren't for sale) is your local historical society. Reenactors have to get their costumes somewhere, and often they are made locally from patterns in the society's archives. Try calling your local historical society and asking for the volunteer coordinator. This individual is usually in charge of the reenactor clothes that their volunteers wear. Reenactor groups: While you may need to join the group, there are always contacts within these groups that make costumes for other people. In most cases they are more than happy to allow members to make copies of historical costume patterns. Friends and family: You may not automatically think of borrowing costume patterns from relatives and friends. Think of the people that you know who sew, then give them a call. People who sew often stockpile patterns. Offer to borrow, sell or trade patterns that you own with them. The Internet can be a good resource for finding free costume patterns. Whether you need costumes for kids or adults, angels or pirates, you'll find patterns for them online. The following sites offer free patterns and how-tos for clothing, accessories and props that you may also need. Copying patterns sounds easy, but you will need a few tools of the trade. Depending upon the size of the pattern (for a baby, a child or adult), you'll need the appropriately sized paper to copy onto. White butcher paper is one of the easiest ways to copy just about any sized pattern because of the wide width. Brown butcher paper can also be used if you are placing the pieces of the pattern on top of the paper and then sketching around it. Don't use markers or pens to sketch your free costume patterns. Despite being very careful you'll inevitably get some ink on the pattern you are trying to copy. Errant marks can be confusing once you start cutting the fabric or sewing. It is better to use a soft pencil to trace patterns because marks made in error can be erased and you'll be less likely to poke a hole in the paper. Before you decide to hold a pattern in place with pins while tracing it, consider how that will affect the original pattern. Tissue paper patterns can tear easily, especially if they've been used before. There are a few other methods that you can use, beside pins, to hold the pattern in place while tracing it. Removable transparent tape can be very handy when doing this (be sure to read the label since not all tapes are removable). Of course you want a jaw-dropping costume. Whether you're creating your own because you find it fun or because your funds are limited, you'll appreciate the extra money in your pocket once you find the perfect free costume pattern. The only down side is that you'll need to search for your pattern, fabrics, and thread well in advance. It's not as easy as popping into a Halloween shop as soon as it shows up in an abandoned store.